All that was written about his good traits are true and indisputable particularly, Pacquiao being very caring and exceedingly thoughtful. Case in point: the Filipino fighters on the March 15th under card, Diosdado Gabi and Ernel Fontanilla. Pacquiao made sure that Diosdado Gabi got a fight on the undercard. His underlings could have done the legwork to assure that Gabi will get one. But he still put up the good word and Arum listened. With that, Gabi landed a fight. Gabi is scheduled to face Abner Mares, an ex-Olympian who has a perfect record of 15-0-0 (9KO). Amongst his victims is Filipino Robert Allanic who he stopped in a fight held at Philadelphia, PA last year. Gabi, in spite knowing his opponent’s outstanding record remains unfazed. “Its just me and him on the ring, so I have a fifty-fifty chance, he said to me as he watched me fabricate a new mouthguard for him and Fontanilla today at my office. Gabi and Mares will fight a 10-rounder and they will most probably open the pay-per-view card which starts at 6:00PM Pacific time. Then there is Ernel Fontanilla. Again, through the intercession of Pacquiao, Fontanilla got an 8-rounder on the March 15th undercard. Fontanilla is protégé of Boboy Fernandez, Pacquiao’s long time sidekick and trainer. But even with that, without a good word from the man himself, Fontanilla would not have gotten a slot on the under card. Pacquiao did not have to assure that the boys got a fight on the same night he will face Juan Manuel Marquez. In fact, his only responsibility was to prepare himself for the big night in Las Vegas. But such is Pacquiao. His thoughts are never centered on himself. He constantly think about his family, his friends and the people around him. He is never at ease unless all of them are doing okay. In fact, contrary to what has been reported, he is so aware of his surroundings and the day to day happenings that revolves around him, even the little details. How do I know? Pacquiao spoke to me on the phone last Monday to offer his condolences to me and my family of the passing of my sister. If I operate at the center of Team Pacquiao, I would have expected that. But, I am just on the fringes. So for him to do that is so thoughtful of him. Awesome, if I may add. 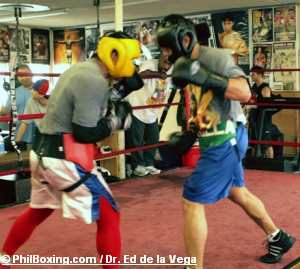 Top photo: Pacquiao (L) in a recent sparring session at the Wildcard Gym in Los Angeles.